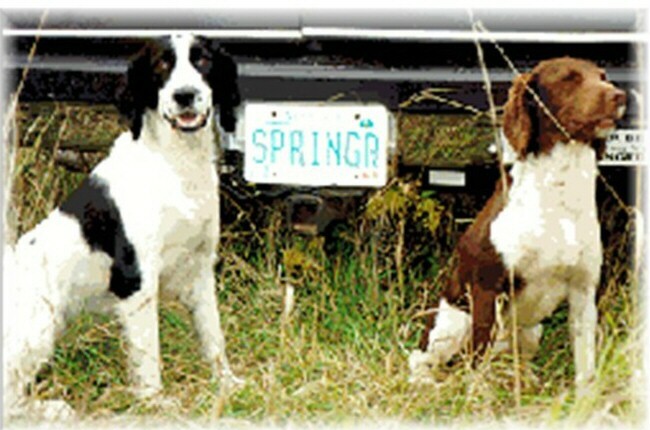 I have been a breeder of "Field" English Springer Spaniels since 1969, and am an avid hunter and sportsman. I have placed puppies in most states throughout the country. Breeding is a very serious hobby, but not my living. I therefore am very selective in my breeding practices and breed for instincts, temperament, and trainability; one without the others would not be the dog a Springer Spaniel should and must be. I am a active member of Pheasants Forever, and officer and board member of Minnesota Waterfowl Association, a long term officer of the Minnesota English Spaniel Club, a member of ADOA (American Dog Owners Association), ESSFTA (English Springer Spaniel Field Trial Association), the ONLY Field Springer Breeder accepted for membership in the MPDBA (Minnesota Purebred Dog Breeders Association.) an AKC public education coordinator/canine ambassador, and have appeared on cable TV promoting and education about the breed. I have had the pleasure of judging hunt tests and licensed All-Age Cocker, Water Spaniel, and Springer AKC field trials in the U.S. and Canada. I continue to compete, along with my grand daughter, in countrywide field trial competitions, and usually qualify and compete in both the US and Canadian Nationals. Each of the last 18 years I have conducted mini training seminars at "Game Fair" held at the Armstron Dennels in Anoka MN. On several occasions I have been invited and conducted information sessions at Gander Mountain, for Boy Scout groups, FHA groups, at the Minnesota State Fair, and am open to other special requests. On my 30 acre hobby farm, I offer training advise, help "train the trainer", and invite folks curious about the breed to visit and/or watch how we train. (My training methods are 98% positive reinforcement) My breeding program has consistently porduced top hunting, trial, and family dogs. Eighty percent of my clients are either referrals from previous owners, or repeat clients, but I choose to advertise both Nationally and locally year round, as part of my desire to educate the public and allow them to observe a quality standard to compare to.